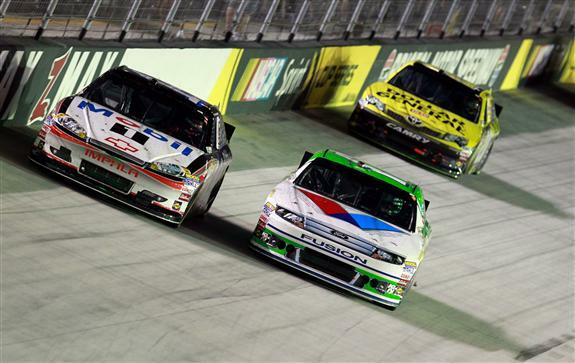 Despite all three Roush Fenway drivers leading laps at Bristol, their finishes were not up to par. One highlight after Bristol is Greg Biffle maintains the points lead and has clenched a spot in the 2012 Chase. A shout out to Greg Biffle and Matt Kenseth for their pre-race involvement. When the MRO children sang the National Anthem, "The Biff" was front and center with little Emma and Matt was there with Kaylin. Adorable is the only word to describe this great tradition at Bristol. It is shocking to say that Greg Biffle's 19th place finish was the highlight for the Roush stable. After leading 41 laps, a late race pit stop to make adjustments ended up hurting the No. 16 team. Biffle lost track position and finished the night in 19th. On the plus side, he is Chase-bound after holding onto the points lead. Biffle took to Twitter after the race: "Not the night we were looking for, hitting the track a little bit on exit and chattering the RF!!! But we have a spot in the chase!!" What a race the No. 17 team was having, racing for the lead alongside Tony Stewart, then BAM! Both drivers crashed and damage to Kenseth's car took some time to repair. Finishing the night in 25th, 14 laps down, Kenseth was unable to clinch his Chase spot this week. After the race, Kenseth tweeted, "Man, tough weekend. Sitting here thinking about Kaylin singing the national anthem tonight with a big smile on my face.... #prouddad." PR - What happened with Stewart? PR - He said he's going to run through you ever chance he gets. With just two races until the Chase, it is all or nothing for Carl Edwards heading into NASCAR's version of the playoffs. Edwards had a strong run at Bristol, leading 45 laps. But as the race started to wind down, he made a costly error when he decided not to pit. The No. 99 slipped from the lead as the tires just lost grip, sliding backwards. The pit error cost the team dearly when Edwards ran out of gas with just four laps remaining. After hitting pit road for a splash-and-go, he finished the night in 22nd.